Foodie restaurants love this ritzy Italian corn porridge they like to call "polenta." They use this golden glop as the architectural foundation for artful and lofty constructions of salmon and asparagus spears, garnished with lemon and dill; or as the backdrop for dramatic plates of rack of lamb or Cornish hens. I can take you to places in San Francisco where a plate of simple polenta, beautifully presented for lunch and topped with a spoonful of marscapone cheese, will set you back $12, not counting the side salad and a glass of Napa gewurtz to wash it down with. Of course, being half-hillbilly, I find this ridiculous. (Delicious, and I'll pay it, but ridiculous nonetheless.) Back in the day, in the two-room cabin I called home until I was 10, my mama made the exact same stuff, packed it with Velveeta, and called it cheese grits. Since we lived so far out that she only went into town shopping once a month, grits -- served alongside some canned peas and a few pan-fried rainbow trout we caught in the creek -- were standard empty-pantry fare in that last week before Mom went back into town. This time of year, when it's cold and howling out, grits (polenta, if you insist) are a great winter comfort food. It's what's been for dinner around here a lot recently, and since I'm nowhere near getting tired of it, I'd like to share a plate of it with you. Great grits start with the grain itself -- it's one of those things, like rice, where quality is everything. You can buy the good old American Argo stuff off the shelves at Safeway, and it's OK. Don't bother with the high-priced imported polenta at the Italian specialty markets -- it's usually stale, and far fussier to cook up than it needs to be. And I hope it goes without saying that quick-cook grits are, quite simply, beneath the level of this discussion. Put the water, milk, and some salt in a large saucepan. Bring to a rolling boil. Add the butter and allow it to melt. Then, sprinkle in the grits -- slowly enough that you can see the individual grains as they fall. Stir as you go. Lower heat to a simmer, toss in the grated cheese ends, and cook and stir for about 10 minutes. The mixture should have begun to thicken nicely and look uniformly grainy (though still very wet) by the time this part is done. Serve grits in a large shallow soup bowl, topped with a tablespoon-sized dollop of marscapone and a light sprinkle of pepper, parsley, and/or paprika. It'll look just like it does at McCormick & Schmick's in downtown San Franciso -- but you get to eat it at your own table, for pennies on the dollar. Don't let the leftovers sit too long. Spread them into a baking or bread pan, cover, and refrigerate. The grits will firm up and become a solid loaf. You can either slice it up and fry, grill, or bake it; or thin it back out to porridge by putting it over heat and stirring water or milk into it until it's hot and the lumps are gone. Now that you've got this huge pot of grits, what do you do with it? -- A family of four can make light dinner out of fresh-cooked grits -- put a salad and some sliced cheeses, cold cuts, and/or olives on the side -- and still have plenty of leftovers. 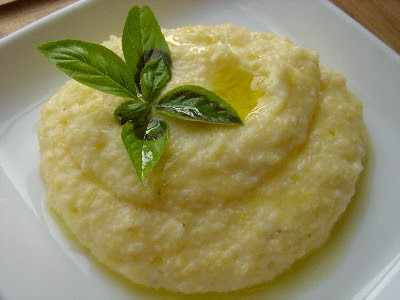 -- The next night, grill thumb-thick polenta slices and serve as a side dish to a meat or fish entree. -- Or cut it into 4"x4" squares and bake it through until it's hot and slightly browned. Put a square on salad plate, lay a 1/4" thick slice of mozzarella or bocconcini to cover the top, ladle a nice marinara over the whole thing, sprinkle with some minced basil, and it's a main dish again. -- A pot of fresh, hot grits are a great potluck offering (and the vegetarians will thank you). Is it grits? Or is it polenta? Who cares, as long as it's hot, filling, and good?